Isaiah makes his debut at Vancouver Opera with a return to the role of Count Almaviva in The Barber of Seville, opposite the Rosina of Julie Boulianne. Isaiah returns to Opera Atelier in Spring 2020 as St. John in Handel’s early masterpiece The Resurrection. Isaiah returns to the Toronto Symphony for Mozart’s arrangement of Handel’s Messiah in December 2019, with conductor Alexander Shelley and soloists Jane Archibald, Emily D’Angelo, and Russell Braun. 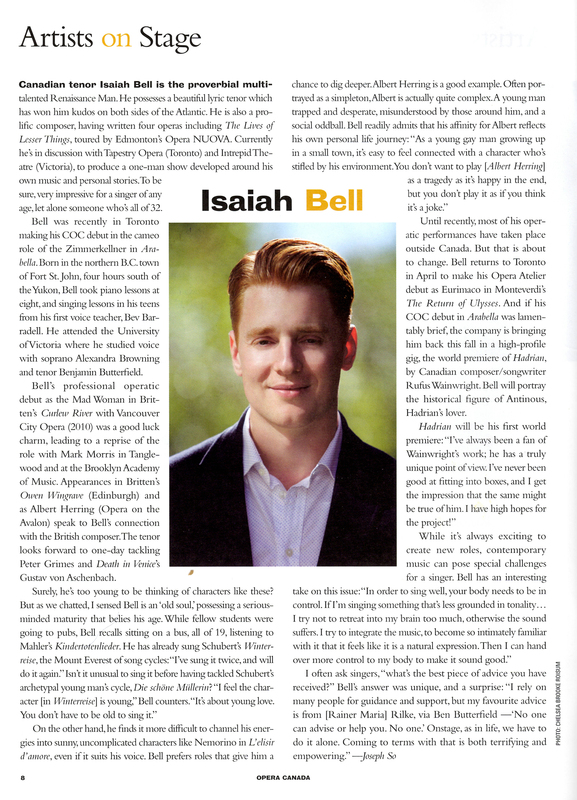 Opera Canada magazine published a profile of Isaiah, by Joseph So, in a recent issue. Read it here. Isaiah revisited the role of the Madwoman in Mark Morris’ production of Curlew River, giving what The New York Times described as “a performance of exquisite poignancy.” The piece was paired with Morris’ Dido and Aeneas, starring internationally renowned mezzo-soprano Stephanie Blythe as both Dido and the Sorceress. Bell boasts a strong, glorious voice with heroic, oratorio-style ring. Soaring easily into light sweetness at the start of the duet, he subsequently demonstrated that he can produce multiple colors lower in the range and darken his instrument to proclaim with authority when necessary…Bell’s sound is so classic English, and so fresh, that one can simply hope that he will sing as wonderfully as he did on Friday for decades to come. – San Francisco Classical Voice, reviewing Handel’s Ode for St. Cecilia’s Day with Philharmonia Baroque. The San Francisco Chronicle, reviewing the American premiere of Tarik O’Regan’s Heart of Darkness at Opera Parallèle, described Isaiah’s performance in the lead role of Marlow as “sung with exquisite lyricism and an air of heroism…” Read the whole review here. Isaiah Bell was quite stunning in his vocal subtlety and strength. Bell’s voice is so pure and full, with such a lovely ring and evenness in his tone production. His renderings of both “Saget es, die ihr erlöst seid…” and “Stricke des Todes” were events in themselves, and added noticeably to the electricity of the proceedings.